I apologize in advance, but todays topic again is totally geeked out… Today, I have made the swtich from Terminal.app to iTerm, and I think it’s going to be a switch for good. The iTerm team has been cranking out a OS X Terminal Emulator for years, but they have made amazing strides lately and iTerm LOOKS BETTER than the build in Terminal. Of course, you get tabs and great unicode support too. I am very happy with the latest version of iTerm. If you frequently user Terminal, I highly recommend you give it a shot, again! 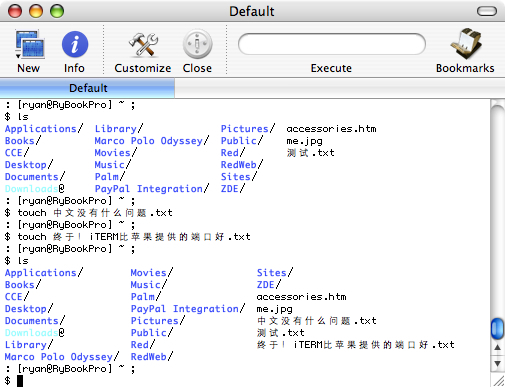 Note that if you use Chinese in your terminal, you’ll want to make sure that you’re configured for UTF-8. Use the settings on this page to enable full UTF-8 input and output. Previous PostReplacing Redhat with UbuntuNext PostMIME Madness… Why no “Email XML”?